Today’s tip Tuesday is all about creating buttercream stripes on your cake. These cute, symmetrical stripes are a look we often see with fondant and are now starting to see a lot more with buttercream. With it becoming such a popular technique, I thought I’d try my hand at it with a recent Halloween cake. First, let’s talk about what I did in this video and then we’ll talk about what I’d change for next time. I started with black buttercream and then used the lighter color over it. For the texture, I used a plastic cake scraper from the Sweet Tooth Fairy collection. After scraping the cake with the cake comb, I froze my cake for 15 minutes. I then scraped the orange over the black until the orange was mostly off the black. I used a piping bag to apply the second color. Next time, I might choose colors that don’t contrast so much. Black is definitely a tricky color to work with and this particular black buttercream doesn’t set as well as my classic vanilla buttercream, causing the black to move around a bit even after I froze the cake. I think my next try will be more monochromatic. I’ll also be getting this metal cake comb for next time. I’ve tried several plastic and acrylic cake scrapers and haven’t liked a single one. I think they are too thick and don’t scrape as smoothly. Metal is definitely the way to go. As for freezing the cake in between the first color and the second, I’ll absolutely continue doing that. I like that the dark color sets and how easy I can scrape the lighter color over it. I also think the piping bag is the way to go for adding the second color. It will really help you get nearly clean lines. A few of you asked about making these stripes without the cake comb. Can it be done? Totally! It might not be quite as symmetrical as using the cake comb, but you’ll get a pretty similar look. To do it, apply your first coat of frosting, smooth it out, and then run a kitchen knife around the cake as you turn it on the turntable. This should make an indentation like the cake comb does. After your first strip, move up the cake about the width of your finger and create your second stripe. Continue this until you reach the top of the cake. 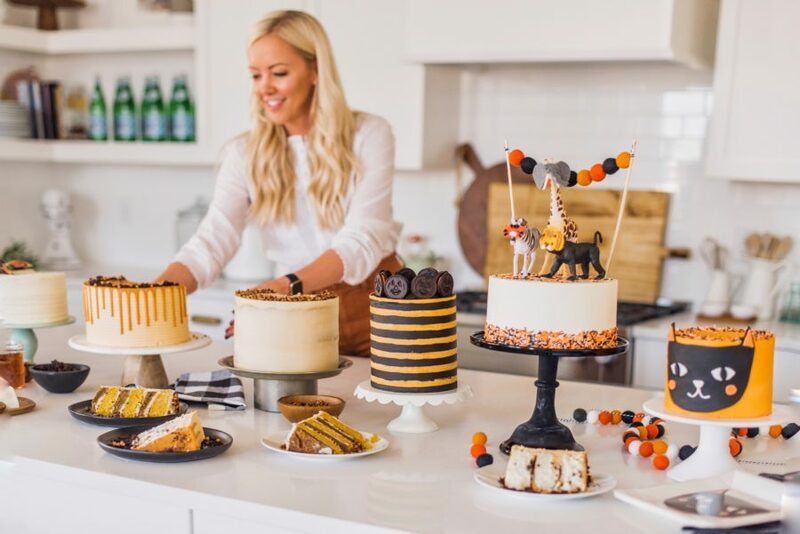 Can’t wait to see your striped cake creations! Good luck!